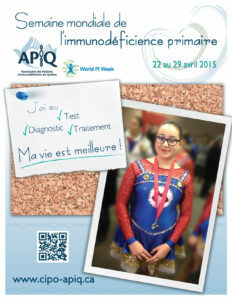 CIPO (the Canadian Immunodeficiencies Patient Organization) is Canada’s only patient organisation dedicated to primary immunodeficiency diseases (PIDs). Founded in 1997 as charity organisation, we are currently entering our 20th year. We are an organisation run by patients, family members, caregivers and people whose lives are affected by PIDs. Our goals are to support, educate and advocate all patients and families living and affected by PID in Canada. Our mission is to attain comprehensive care for all PID patients in Canada. This will be achieved through collaboration with healthcare workers, caregivers, and patients themselves to bring together the best knowledge and care for all PID families and patients. In today’s medical world we are striving for the funding and education to bring forward a better understanding of rare diseases. The IDF slogan: “When you hear hoof beats, think zebras, not horses”, is a saying that we at CIPO endeavour to spread across Canada to carry the message of not only PIDs, but rare diseases. Misdiagnosis in PID patients is a common factor due to the variety in which patients can present. Our sights are set on all healthcare workers thinking more outside the box when faced with these complicated diagnoses. We are inclusive to patients, striving only to benefit the lives of those diagnosed with PID. Creating a space where PID families can come for support and help. Stretching from coast to coast across Canada, connecting people in patient support groups and patient information meetings. We are able to form connections to specialists and suppliers that is creating an immunodeficiency community that is closer and allows access and education at an amazing rate. CIPO is at the doorstep of helping to create Government support such as mandatory newborn screening for SCID (Severe Combined Immunodeficiency), achieved already in Ontario and Eastern Canada. We will continue with our advocacy efforts with the Government in support of all PID patients in order to improve the lives of those living with PID. We are volunteers that are effected by PIDs, we are founded on Integrity, Honesty and Respect. 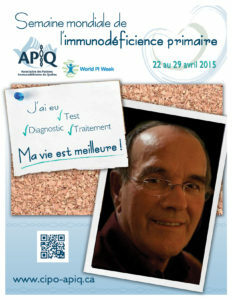 CIPO is a registered Charity and a member of IPOPI and of the Network of Rare Blood Disorders Organizations (NRBDO), with members who sit on both Canadian Blood Services and Hema Quebec committees, as well as being a part of the Canadian Haemophilia blood safety committee, working with CHS to insure patients have the safest blood products possible. If you live in Canada and if you or your loved ones are in the PID community, reach out and join us in changing the future of our community. We have provincial chapters in British Columbia, Alberta, Manitoba, Ontario, Quebec, and The East Coast. We are here for every patient diagnosed and their families.